Also because I love it, but make no mistake: I love it because it’s so cool and unique and complex. Plus the whole thing with warm summers, hot dogs, cold beer, and good baseball. One of the many things that turns out to be so interesting about baseball is how asymmetrical it is compared to other sports. There is an almost mirror symmetry to most games, but baseball displays that only in a few places. I’ve had to keep reminding myself what each of those three mean. Seems like the easiest thing is to finally write it all down in a post. Field is an obvious one, a good place to start. Nearly all sports have a rectangular field of play. All the volley sports mentioned above do. So do the “soccer” sports: soccer, basketball, hockey, and lacrosse, for instance. Importantly, both volley and soccer sports have mirror symmetry between opponents. There is usually the concept of “sides” — one for each team. Further, there is typically a “goal,” which is attacked and must be defended, at each end. These fields are also bilaterally symmetrical, they are the same from side to side. They have the same symmetry as all rectangles do. The border of the rectangle is an important legal game boundary. Most such games have an “out-of-bounds” concept. The “bowling” sports (bowling, golf, horseshoes, bocce, curling) feature the concept of a “lane” with the (usually lone) player at one end and the “target” at the other (target shooting is a form of bowling sport). The only symmetry of field in these is bilateral. A line drawn down the lane splits it into mirror halves. Golf lacks even that bilateral field symmetry. Each hole has its own distinct geometry, and the course can be any shape at all. About the only symmetry in golf is the round ball! A baseball diamond, just the diamond itself, very nearly has bilateral symmetry. The exception is the runner’s lane leading to first base. A baseball field, however, is only bilaterally symmetrical in a rough sense. The outfield fence, in both shape and height, is unique to each ballpark and not at all symmetrical from foul pole to foul pole (unless the designer was really in love with symmetry). Of course all sports venues differ, but the playing fields usually don’t. In baseball, the playing field varies considerably from venue to venue. That difference is part of the sport. Different ballparks are known as “hitter’s” or “pitcher’s” parks depending on who gets the advantage. Large outfields with distant fences tend to be pitcher’s parks. Working backwards (on my note), batting next: Team. In most sports that even have teams, the teams are symmetrical. There are the same number of players filling the same number of roles. The symmetry tends to be pretty exact with teams. Baseball is not an exception in the overall sense, but it does differ in what happens during play. Usually there is balance in the opposing teams. It may be that, as in football, there are separate offensive and defensive teams, but the number of players facing each other is roughly symmetrical. In the soccer sports, possession switches fluidly, so the players on the field shift between acting defensively and offensively. The team symmetry is even stronger then. Volley sports trade possession back and forth between symmetrical teams. The golf sports tend to focus on individual performance, but to the extent teams exist, they are symmetrical. My bowling league, for instance, had teams of four members each. In professional baseball, there is a 25-man roster (which plays games) and the 40-man roster (which includes the 25-man roster plus players who can be “called up” if necessary). In this sense, the teams are absolutely symmetrical, but the content of those rosters does vary a bit between teams. Some may carry 12 pitchers in the 25-man roster, others may carry 13. Other than needing to fill the nine field positions, which includes pitching, there aren’t many constraints (those realities provide plenty). So teams may be symmetrical in the large, if not in the details. The situation during play, however, is entirely different! In baseball, the defense consists of the entire team on the field, all nine players. The offense consists of a single player at the plate. While there can be up to three other offensive players on base, the situation is still decidedly unsymmetrical. “Bases full” — odds of four against nine — still makes the defending team sweat. The asymmetry of play is balanced by the damage that single batter can do. In some regards, baseball is a symmetrical battle between the pitcher and the batter. The pitcher does get a lot more support, again because well-hit balls win games. There is a natural asymmetry in the very idea of offense and defense, yet there is also a Yin-Yang balance, which is a symmetry. Further, the roles of offense and defense switch back and forth, which enhances the symmetry. Most sports view this symmetry as fundamental to fair play. Each team or player gets a fair — equal (symmetrical!) — chance. In volley and soccer sports, offense and defense shift rapidly. The regular back-and-forth nature of volley sports earns them their name. In the soccer sports, possession (offense) is taken by defensive action or received (due to offensive error). Baseball, along with most bowling sports, involves taking turns. Players take turns (“at bats” in baseball), and sides take turns. Football (and rugby, I assume) have “downs” which is turn-taking combined with the possibility of losing possession. What I meant is how the game plays out as you watch it. How symmetrical the activity on the field is. Thinking about that prompted the note that prompted this post; he’s right. It’s even just possible we could remove the word “major” from his quote. There is no text or numbers visible. We do not know any of the players (or the team). We do not know the stadium, field, or course. I think Carlin is right; every other game has mirror symmetry. The baseball rules require the players run the bases in the correct order. All other games would look the same reflected in a mirror. Bowling? The pins aren’t labeled (no numbers allowed). The only exception I can think of is NASCAR. They always drive counter-clockwise. I don’t know how traditional that is in other racing. So there it is. Baseball (and NASCAR) has a special element that identifies it from all other sports: You’d know if you were in Mirror World if you watched a baseball game! This entry was posted on Tuesday, February 5th, 2019 at 7:23 pm	and tagged with baseball game, baseball is boring, baseball park, baseball team, Emmy Noether, George Carlin, MLB baseball parks, symmetry and posted in Baseball. You can follow any responses to this entry through the RSS 2.0 feed. 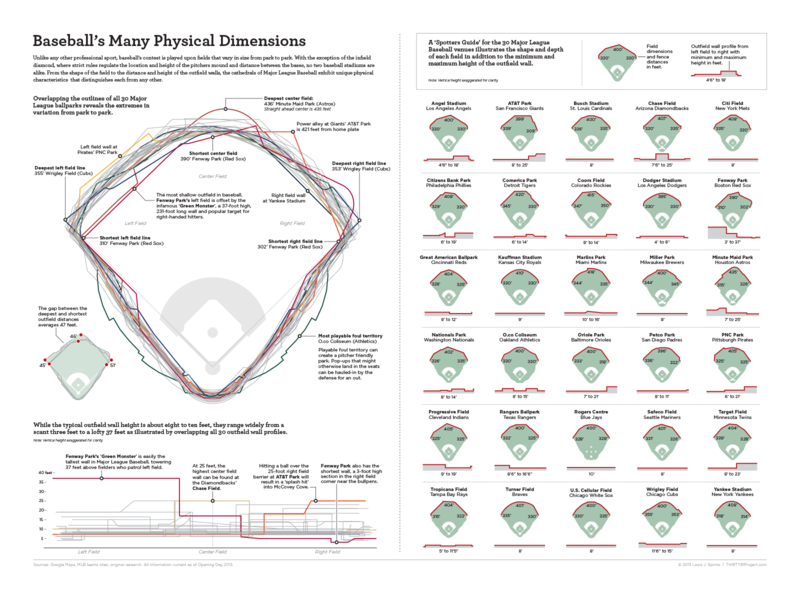 Here’s an interesting comparison of baseball parks. Spam has been picking up lately. Had eight today! I comment about that here because I feel bad a great post like this gets no love or comment! And so I’m closing comments on posts older than 60 days for a while until the fuckers go away. Then I’ll re-open them.